… if these layered bits of experience do not add up to the traditional depiction of one grand unified identity, they nonetheless reveal a productive authority … “To find her own voice” implies a great deal more than expressing a thought or opinion; it also carries a healthy blend of satisfaction and bravado. The whole world is a stage, the autobiographical self may be a representation, but is her voice. How does this statement, written near the end of her autobiography, reflect on the lively account of art and love which Isadora Duncan has given her reader? Faced with the daunting task of creating a coherent literary account of her life, Duncan tries to tell her story only to realize (some three hundred pages later) the impossibility of such an attempt. … How does the presence of a live body create a representation of identity that differs from literary autobiography? How closely intertwined with its own physical reality is the “self” of dance? … Giving little weight to Duncan’s extraordinary achievement in radicalizing the theatrical dancing of her time, Spacks simply condemns Duncan for recording so convincingly her illusions about her art: “As an autobiographer, Isadora Duncan is dreamer rather than observer of her life: not an artist despite all her assertions of artistry.” Read within the context of her dancing, however, Duncan’s autobiography reveals the very real tensions between her need to justify her work to a society which she feels has misunderstood her art and her desire to share the experience of creative momentum which sponsored her dancing. To efface that dancing body from the writing is to negate a powerful force in the creation and representation of Duncan’s life. … In My Life, Duncan tries to find words which can translate her elated experience of dancing to her readers. What she finds, however, is that in spite of a dramatic mythopoetic voice, the project of writing one’s life exposes the fragility not only of the writing self, but also of the dancing self. … More than a factual document or realistic description of their lives, women’s autobiographies often create a selfhood by virtue of that very process (performance?) of writing. The struggle to mediate between private ambitions and public conditions may fragment a woman’s sense of her self, but if these layered bits of experience do not add up to the traditional depiction of one grand unified identity, they nonetheless reveal a productive authority — a writing self. In much of the feminist scholarship on autobiography, “voice” is seen as a metaphor for the act of inscribing one’s self in the world. “To find her own voice” implies a great deal more than expressing a thought or opinion; it also carries a healthy blend of satisfaction and bravado. The whole world is a stage, the autobiographical self may be a representation, but is her voice. … Some feminist scholars object to a representation of autobiography which situates identity as inherently fractured and multiple, insisting that this decentered subject loses any viable connection to a political community. Seeing instability only in view of its rather frightening psychic consequences, these scholars are nonetheless hard pressed to find a representation of the unified self which does not seem romantically nostalgic. But what if we switch tracks and look at instability as motion — as the beginning of a dance. … However it is, “human nature” is a potentiality. It can be known only as it has been actualized in achievement and history, and as it makes itself today. … Instead of a dynamic unity of need and social convention, in which men discover themselves and one another and invent themselves and one another, we are forced to think of three warring abstractions: the mere animal, the harried individual self, and the social pressures. The normal person either keeps himself unaware of this raging war within his personality, does not notice its manifestations in his behavior, and keeps it fairly dormant, or he is aware of it and has concluded an uneasy truce, snatching at safe opportunities. In either case there is much energy spent in pacification and valuable human powers are sacrificed. In the neurotic person, the conflicts rage to the point of exhaustion, contradictions, and breakdown — nor can it be concluded that he was therefore in some way weaker than the normal, for often precisely stronger gifts are socially disastrous. … If we consider organismic-self-regulation, the process by which the dominant needs come to the forefront of awareness as they arise, we are struck not only by the wonderful system of specific adjustment, signals, co-ordination, and subtle judgment, that go to maintain the general equilibrium, but also by the devices that serve as cushioners and safety-valves to protect the contact-boundary. We have mentioned blotting-out and hallucinating and dreaming, and regarding-as-if, and accepting instead-of; and there are also immobilizing (playing dead), isolating, mechanical trial and error (obsessive re-doing), panic flight, and so forth. Man is an organism of great power and efficiency, but also one that can take rough treatment and bad times. The two sides go together: ability leads to adventure and adventure to trouble. Man has to be malleable. These safety-functions all, of course, play a chief role in mental disorders, but they are themselves healthy. Indeed, without being paradoxical one could say that in the neuroses just these safety-functions — of blotting out, distorting, isolating, repeating — that seem so spectacularly “crazy,” are working fairly healthily. It is the more respectable functions of orientation and manipulation in the world, especially the social world, that are out of kilter and cannot work. … Adapting himself to the vast accumulation of culture, both knowledge and technique, man is educated in very high abstractions. Abstractions of orientation, distance from concernful felt perception: sciences and systems of science. Abstractions of manipulation distant from muscular participation: systems of production and exchange and government. He lives in a world of symbols. He symbolically orients himself as a symbol to other symbols, and he symbolically manipulates other symbols. Where there were methods, now there is also methodology: everything is made the object of hypothesis and experiment, with a certain distance from engagement. This includes society, the taboos, the super-sensory, the religious hallucinations, and science and methodology itself, and Man himself. All this has given an enormous increase in scope and power, for the ability symbolically to fix what one used to be fully engaged in allows for a certain creative indifference. The dangers in it are, unfortunately, not potential but realized. Symbolic structures — e.g. money or prestige, or the King’s peace, or the advancement of learning — become the exclusive end of all activity, in which there is no animal satisfaction and may not even be personal satisfaction; yet apart from animal or at least personal interest there can be no stable intrinsic measure, but only bewilderment and standards that one can never achieve. … Endless energy is exhausted in the manipulation of marks on paper; rewards are given in kinds of paper, and prestige follows the possession of papers. Politically, in symbolic constitutional structures symbolic representatives indicate the will of the people as expressed in symbolic votes; almost no one, any more, understands what it means to exert political initiative or come to a communal agreement. Emotionally, a few artists catch from real experience symbols of passion and sensory excitement; these symbols are abstracted and stereotyped by commercial imitators; and people make love or adventure according to these norms of glamour. Medical scientists and social-workers provide other symbols of emotion and security, and people make love, enjoy recreation, and so forth according to prescription. In engineering, control over space, time, and power is symbolically achieved by making it easier to go to less interesting places and easier to get less desirable goods. In pure science, awareness is focused on every detail except the psychosomatic fear and self-conquest of the activity itself, so that, for instance, when there is a question of making certain lethal weapons, the issue debated is whether the need of a country to get superiority over the enemy outweighs the duty of a scientist to publicize his findings; but the simpler reactions of compassion, flight, defiance are not operative at all. The question may quite seriously be asked, by what criterion does one prefer to regard “human nature” as what is actual in the spontaneity of children, in the works of heroes, the culture of classic eras, the community of simple folk, the feeling of lovers, the sharp awareness and miraculous skill of some people in emergencies? Neurosis is also a response of human nature and is now epidemic and normal, and perhaps has a viable social future. Last week’s Goodman is here. … The listening Subject reappears, as more than a processing unit for conventionalized signs. … The end of interpretation … is to have gained an “understanding” of the work … . To do so demands a willingness to engage with each new work in a manner that is open to the challenges it might bring to preconceptions of any kind. … The life of a world of signs is such that it forms, but is also transformed by, acting and reacting minds, whose interpretive mediation of the world is not “turned off” even in moments of seeming passivity. Uncertainty may be characteristic of the way that signs seem to reproduce themselves, yet that very uncertainty is the condition of a subject’s freedom to move among and transform the modes of signification that he or she has received. … no general sign (whether legisign or code) can, of its nature, fully predict the particularities in which it will be embodied. It can create a framework, a reference point, or a collection of terms within which to describe an experience, but it cannot contain the precise qualities of that experience itself. The qualities of an experience do not need to be viewed as “ineffable” by default, and thus to be rejected as merely “private,” just because they fail to be captured by generalities. They could be dismissed as such, by one (like the early Wittgenstein) who held a view of language which emphasized labeling, that is, the attachment of general terms to objects, and their description in propositional sentences. In fact, as Peirce (and the late Wittgenstein) recognized, they do not need to gain the ignominy of being positioned “outside language” at all — as if “language” consisted in such a limited set of cases. Instead, they may be seen as exemplifying another kind of sign, a quantitative one which may be described in linguistic terms other than those conceived as “labels” in a simplistic sense (that is, they can be pointed at in descriptions which seek to discern qualities of action, or degrees of intensity). … The “aesthetic,” in Peirce’s thought, consists precisely in the qualitative synthesis of disparate properties into an experiential whole, which cannot be grasped simply by paying attention to conventional signs (legisigns and “symbols” within that category). … No matter how long a listener has been exposed to, say, violin music of the eighteenth and nineteenth centuries, he or she cannot claim to offer an aesthetic judgment of a new performer’s interpretation of some work, if his or her text does no more than locate the performance in relation to a recognized style of rendition. Judgments of quality need to be “owned” and individuated in some way. A jaded familiarity with many styles of rendition does not guarantee a “feeling” for the quality of a performance and may at times even inhibit it. That does not mean that a naive and untutored response is necessarily going to do better, as if judgment were to be made in an “immediate” way — unmediated by any kind of stylistic understanding — but it does mean that learning typologies is not enough. Acquiring a knowledge of the range of signification available within styles of composition and performance is the precondition of aesthetic judgment, but remains ultimately inadequate in predicting responses to individual performances. The listening Subject reappears, as more than a processing unit for conventionalized signs. … The “depth” and “interiority,” so questioned in postmodern discourse (as personal qualities, which speak of an unwanted commitment to a “metaphysical” soul), may, [moral philosopher Christopher Cordner] suggests, be rehabilitated without metaphysical excess, if they are seen as qualities that develop through a close attunement to the particularity of any situation, without a desire to reduce it to an example of some known pattern, which can never capture it adequately. … The end of interpretation is not to have produced a graphic analysis, a formal classification, a listing of “codes” and topoi relevant to the work, or even a complex discourse on its modes of signification. It is to have gained an “understanding” of the work, through these (and possibly other) modes of approach. To do so demands a willingness to engage with each new work in a manner that is open to the challenges it might bring to preconceptions of any kind. Even if terms for some aspect of human subjective experience are applicable to elements in a musical work, as part of its signification, it has been shown in this book to be just as likely that the familiar will be transformed and be musically “subjective” taken across the boundaries between the personal and impersonal. … “Everything that is experienced is experienced by oneself, and part of its meaning is that it belongs to the unity of this self and thus contains an unmistakable and irreplaceable relation to the whole of this one life.” [Gadamer] Lest this should seem an exaggerated demand, the experience of a performer could be considered again. To prepare a work, such as Bach’s G-minor solo sonata, for performance, is to engage with its many dimensions, to internalize its possibilities, and to allow its complex demands (both technically and expressively) to extend a previously gained capacity. This is no trivial form of engagement. It demands an intimacy with the work which will, indeed, make it an ongoing “individual” in the life of the one who plays. And I am too knowledgeable now to hurt people imprecisely. Pickles they place at the edge of your plate. And anyway, who has clothes nice enough to be caught dead in? Because you haven’t been excused. ……….And buried in ancient tombs, the toys and games. ……….Surely, all the time. They are lost in thought. Not that the British reflex to SC was all giggly: a few sobersides managed unsmiling denunciation, and they succeeded in disappearing the book within weeks. The dispatch with which the firm of Faber and Faber unloaded its hot potato on the New York remainder market recalls the resourcefulness of the Sienese who, in 1357, having unearthed a statue of Venus and finding it to be evidently demonic, reburied the idol in Florentine territory to work its blight there on the enemy. A somberer note was sounded by an eminent British philosopher, reviewing SC for The New York Times: “The most disturbing aspect of this strange, haunting book … is the resolute silence it maintains on all alternative views.” This rebuke has been taken to heart. Speaking of St. Augustine brings up another dilemma: whether to rest one’s case or risk the grating effect of polemics, insufferable even in a controversialist of saintly stature. Reading, for instance, the aged Augustine’s tract Against Julian, one’s respect for the mighty bishop wavers in proportion to his disputatiousness. Augustine flails and pounds at the underdog, kicking him when he’s down, so that all one’s boy scout morality wells up to protest. Poor Julian’s “fragile and oversubtle novelty is crushed,” crows the saint. “Behold, your whole case is overthrown, ruined, and like the dust which the wind sweeps from the face of the earth.” While the winner exults to have “answered and refuted all [contrary] arguments,” the loser (“a detestable heretic” with a “mind subverted by the vanity of [his] boasting”) grovels in “damnably and abominably impious error.” His “presumptuous attack” is but “obstinacy,” “headlong boldness,” and “madness.” “You are mistaken, wretchedly mistaken, if not also abominably mistaken” — and so on and on. Repelled by these cruel punches, one inclines to forget the stakes (the institution of the dogma of Original Sin); forget that it was Bishop Julian who had started the fight (with a four-book attack on Augustine’s “disgusting” and “blasphemous” treatise On Marriage and Concupiscence); forget how much of Augustine’s counter-invective was period style; forget that Julian’s preceding onslaught had been personally abusive, and that his epithets (“false, foolish, and sacrilegious”) may have struck wounds still smarting as Augustine strikes back. But as we read, Julian’s own scathing (unless framed in his enemy’s refutation) is not at hand; what comes down to us in Contra Julianum is his prostration, suffering kick after kick. Not the most agreeable reading. And now a no-win situation invites me to emulate Julian’s antagonist at his meanest, in the role of the bully. On the other hand: while defense may be admirable in litigation, karate, or chess, it rarely scores in response to one’s personal critics. One reads in old-fashioned biographies about men of mettle who take it on the chin, treating hostility — I believe the phrase is — “with the contempt it deserves.” But such ataraxy is easier envied than imitated; and it is this felt envy which defines the second of the three quandaries I leave unresolved. The gravest of my insoluble problems concerns the reproductions, their number now raised to three hundred, all gray-and-white and some very small. They are — they ought to have been — the book’s beating heart. … When all is said and done, the sublime goes rather well with rational calculation. Critical thinkers have long since admitted into the heart of the city the interstitial presence of poets, and of all those who renounce critical discussion and the constraints of communication, to bring into existence, in one form or another, that which reasons cannot board and inspect. The most “materialist” doctors will grow proud in those moments when they feel a soul within them, in communion with the music that elevates them or with the suffering that recalls them to common humility. The most ardent supporter of a “purely technical” rationality may cite Heidegger, if only to affirm that indeed “we assassinate to dissect,” and to conclude to the impossibility of a rational knowledge that is not reductive … and therefore to the vanity of all criticism of knowledge qua reductive. And the most “reductionist” physicists will affirm that they are sensitive to the splendor of the sunset. … Citing Kant’s famous statement, in the name of which the critical Tribunal has passed so many of its judgments, “thoughts without content are empty, intuitions without concepts are blind,” Whitehead confines himself to adding the premise which according to him, Kant has suppressed: “Intuitions are never blind.” Intuition is never “without concepts,” because it is always decision, the unification of the many, thus and not otherwise. Every intuition is “consequent,” and the concepts invoked by Kant are nothing other than the mode of unification that has prevailed, which, moreover, constitutes as such what is at stake in every flight of speculative experience. Kant, making himself the vector of the somewhat excessive pretenses of conscious, discursive experience, demanded of concepts that they designate the object of possible knowledge that is communicable, capable of being abstracted from the fact constituted by a concrete experience. Whitehead, in contrast, for whom intuitions are never blind, addresses his demand not to experience but to critical consciousness itself. It pertains to consciousness not to verify titles of legitimacy but to accept a creation of concepts that exposes it to adventure, making it capable of providing a thought content to what is felt. It then becomes “verification” in James’s sense, experiencing what is imposed by its abandonment of its position as judge. … If Whitehead had sought plausibility, or the possibility of proving his description to be “better,” the “incurably atomic” character of his metaphysical definition of what is real would indeed have been a weakness, justifying the reexamination of the edifice. Yet according to what constraints should one proceed to this reexamination? How can we avoid ending up with a kind of “rational psychology,” authenticating certain claims and rejecting others? How can we affirm on the same level, the adventures of Kant and those of a shaman, the passion of the mathematician Cantor, feeling the categories of his thought dismembered by the question of the continuous infinity of numbers, and the decision of the mathematician Hilbert, postulating the axioms that domesticate the Cantorian infinite? In short, how can we avoid a normative sociology, prescribing the right way to frame the problem, what dictates its solution, what sorts out beings according to whether they do or do not have the ontological right to exist? How, also, can we avoid a confrontation between rival endurances: is time the number of motion, designating the great regularities of nature, or is it the subjective condition of our human intuition, with the great natural regularities then becoming relative to the endurance of the subject of knowledge? The heavy, ancient presence of the mountains, already evoked by Whitehead in Science and the Modern World. Those who feel it can always shake themselves, come back to earth, and laugh at what they have experienced. We have ready-made words — imagination or daydreaming — to cancel the interstitial experience rejected by our impatient certitudes, our specialized criteria, correlates of the abstractions that matter socially for us. 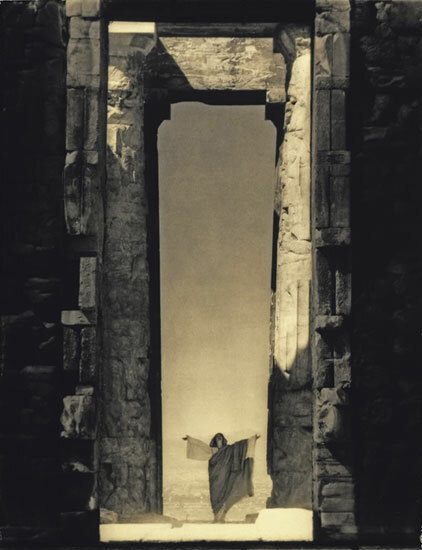 Nevertheless, for a time, before the interstice closed, the mountain, ancient and heavy, was no longer “there” for the subjects perceiving it “here,” a colorless, motionless form which they could approach if they chose. … For Whitehead, the dynamics of possession, obsession, and capture must not be explained in a specific way, as would be the case if autonomy were the norm. They exhibit, in a somewhat exacerbated mode, a generality that refers both to the order of nature and to the regimes of production of conscious experience. No experience can be separated from the play of partial, selective repercussions that it unifies on its own account. … “What is required by your hold?” : such a question affirms and presupposes that the others’ dreams, like yours, are created according to the means of their own adventure, and to this extent this question constitutes a test: it is a question that beings of power will have difficulty tolerating, proceeding as they do in the name of an intangible right [vs wrong] that must be satisfied everywhere, which recognizes no difference between here and there, other than that of the parasites to be eliminated so that they themselves may be confirmed. Yet it is a question that one dreamer can address to another dreamer, for dreams do not abstract from the means, but rather dissolve the dreamer’s identity in adventures that restore to the “means” their mode of actual existence: that of propositions that possess individuals far more than individuals possess them. This is why, when philosophy has succeeded doing what it can do, not only is wonder still there, but it henceforth infects all the statements whose vocation was to explain the world, that is, to disenchant it. … Thought is no longer the exercise of a right [vs wrong] but becomes an “art of consequences,” consequences that leap from one domain to another, or, more precisely, that make interstices zigzag where a homogeneous right [vs wrong] had seemed to reign, and make connections proliferate where “this has nothing to do with that” had prevailed. … At this place, as nowhere else, you can step off the Great Plains directly onto a Rocky Mountain summit. It is known to geologists as the gangplank. Rhinoceroses lived through those changes, and ancestral deer and antelope, and little horses with three toes. As altitude and aridity increased, a subtropical world of figs, magnolias, and breadfruit cooled into forests of maple, oak, and beech. Altitude alone could not account for the increasing coolness. It foreshadowed the coming ice. The burial of the mountains continued far into the Miocene,with — as Love described it — “surprising thicknesses of sandstone and tuffaceous debris.” Volcanic sands, from Yellowstone and from elsewhere to the west, were spread by the wind, and in places formed giant dunes. Two thousand feet of sand accumulated in central Wyoming. Nineteen thousand — the thickest Miocene deposit in America — went into the sinking Jackson Hole. From the Wind River Mountains southward to Colorado and eastward to Nebraska, the plain was unbroken except for the tops of the highest peaks. Rivers were several thousand feet higher than they are now. The ranges,buried almost to their summits, were separated by hundreds of miles of essentially flat terrain. Mountains that were completely covered — lost to view somewhere below the water-laid sediments and deep volcanic sand — outnumbered the mountains that barely showed through. At its maximum, the broad planar surface occupied nearly all of Wyoming — upward of ninety per cent — and on it meandered slow streams, making huge bends and oxbows. As events were about to prove, the deposition would rise no higher. This — in the late Miocene — was the level of maximum fill. For something began to elevate the region — the whole terrane, the complete interred family of underthrust, upthrust, overthrust mountains — to lift them swiftly about a mile. “The uplift was not absolutely uniform everywhere,” Love said. “But nothing ever is.” What produced this so-called epeirogeny is a subject of vigorous and sometimes virulent argument, but the result, continuing to this day, is as indisputable as it has been dramatic. It is known in geology as the Exhumation of the Rockies. From around and over the Wyoming ranges alone, about fifty thousand cubic miles have been dug out and taken away, not to mention comparable excavations in the neighboring cordillera. Though the process has been going on for ten million years, it is believed to have been particularly energetic in the past million and a half, in part because of the amount of rain that fell on the peripheries of continental ice. In response to the uplift, the easygoing streams that had aimlessly wandered the Miocene plain began to straighten, rush, and cut, moving their boulders and gravels in the way that chain saws move their teeth. The streams lay in patterns that had no relationship to the Eocene topography buried far below. Some of them, rushing along through what is now the Wyoming sky, happened to cross the crests of buried ranges. After they worked their way down to the ranges, they sawed through them. Some effects were even odder than that. If a river happened to be lying above a spur of a buried range, it would cut down through the spur, and seem, eventually — without logic, with considerable magic — to flow into a mountain range, change its mind, and come back out another way. “Eventually,” of course, is now. … In fact, there is no obvious relationship between most of the major rivers in Wyoming and the landscapes they traverse. While rivers elsewhere, running in their dendritic patterns like veins in a leaf, shape in harmony the landscapes they dominate, almost all the rivers of the Rockies seem to argue with nature as well as with common sense. 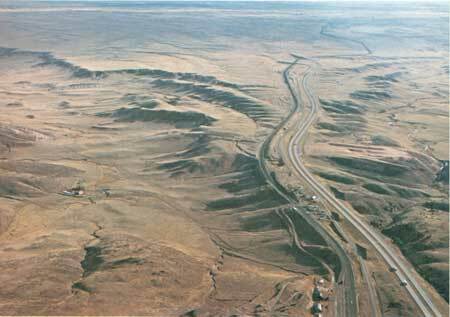 … On the east flank of the Laramie Range is a piece of ground that somehow escaped exhumation. Actually contiguous with Miocene remains that extend far into Nebraska, it is the only place between Mexico and Canada where the surface that covered the mountains still reaches up to a summit. To the north and south of it, excavation has been deep and wide, and the mountain front is of formidable demeanor. Yet this one piece of the Great Plains — extremely narrow but still intact — extends like a finger and, as ever, touches the mountain core: the pink deroofed Precambrian granite, the top of the range. At this place, as nowhere else, you can step off the Great Plains directly onto a Rocky Mountain summit. It is known to geologists as the gangplank. … Could it be that the human mind was not designed to comprehend the world on so small a scale? … The greatest problem for early microscopy … was that it was largely a science ahead of its time. The details of nature’s handiwork that the lens revealed were wonderful and unexpected, but there was (particularly in the case of living organisms) no theoretical framework for understanding them. Once the astonishment subsided at the discovery that nature goes on revealing order and form as we look ever more closely, the question became whether all these details could be interpreted, and whether they led us to a deeper understanding of the properties of matter. After the first flush of enthusiasm in the 1660s, it started to become clear that, on the whole, they do not. Certainly, there were a few instances where microscopy genuinely advanced knowledge. Jan Swammerdam dissected insects and showed that the ‘king’ bee of a colony is actually a queen, possessing ovaries. His detailed observations of insect physiology helped him to characterize the life cycle of insects, from egg to larva, pupa and mature adult. Meanwhile, the Italian physician Marcello Malpighi at the University of Bologne saw that the network of blood vessels explored by William Harvey extends all the way to microscopic capillaries, belying the old idea that the blood circulates by simply soaking into the tissues. … But successes were uncommon. Hooke’s hope that the microscope would reveal the physical structure of memory — a ‘Chain of Ideas coyled up in the Repository of the Brain’ — came to nothing. Too often the microscopic structures were mute, fuelling the accusation that the experimental philosophers were indulging useless curiosity about irrelevant minutiae. The dream that microscopy would ultimately reveal the basic atoms of matter turned instead into a fear that greater magnification would show an endless regress of unintelligible structure. Nothing would appear the same to him, and others: The visible ideas of every thing would be different. So that I doubt, whether he, and the rest of men, could discourse concerning the objects of sight: or have any communication about colours, their appearances being so wholly different. In some degree this is a valid argument against excessive reductionism: we can’t tell the time from the atoms of a clock. It also cautions against trying to interpret the microworld with reference to macroscopic concepts and objects: as Joseph Glanvill put it, ‘there’s but little resemblance between the Mucous sperm, and the completed Animal.’ But it also reiterates the fact that experimental philosophy had revealed a plurality of worlds, while raising doubts about the extent to which they can communicate with one another. Put another way, it seemed to make the microscope an instrument that could serve curiosity but not science. … much more is required … in order that what is given, gracious as it is, should come and sit next to me; in order that I might actually observe something. … For the last two hours this morning I have been tasting the sun in the theatre at Epidaurus, alone, reclining against one of the steps. During the winter solstice the deluge of tourists slows to a trickle: a truce in a new war. Peace in the transparent air, yellow and blue. … The silence within the theatre and in the surrounding scrub seeps into my skin, bathes and penetrates it, vibrates and drains it, in the hollow of the empty ear. … Horror. Here comes a group. I can hear it in the distance, coming this way. It projects itself across space as filthy noise. It is deafening, disturbing the transparency of the air, even before I can see it from my vantage point, coming out of the tunnel of green branches. Two, ten, forty people are encased in a shell of language and then in a rumbling outer hull which precedes, flanks and follows them like the prow, sides and stern of a bulky ship. The sea vibrates around the vessel, overwhelmed. It is here. A whole orchestra. They talk, squawk, discuss and exclaim, admire out loud, call to each other, give explanations, point out this, describe that, read the guide-book, lend a distracted ear to its explanations and test, for the hundredth time, the location’s exact acoustic properties. A din in the great ear of society. The fearful gods have fled from this eruption, as have healing, and the harmony between our organs and the things of the world. Its cries exhausted, the group moves on, trailing a long train of language behind it; and its fractious wake, still vibrating in the buffeted air, evaporates in turn, the stain disappears, and the smooth silence returns like offended modesty. 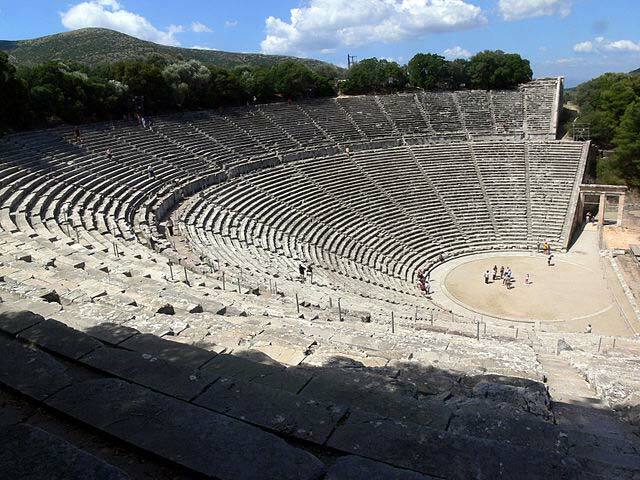 … Did they come to Epidaurus at all? They arrived ill, indisposed by the murmuring of their organs, surrounded by their collective noise, and they departed in that clamorous ship without ever really arriving. If they had talked, shouted, conversed with each other in Boston or Aachen, they would have made the same journey, but for the rain in one and the snow in the other. … Silence returns like a modest veil. Slowly. The immortals are hesitant to descend to such an easily sullied place. The gods pass us by, weightless, insubstantial, flanking non-existence, evanescent spirits; the least wrinkle in the air will chase them away. … Immobile, in the sunshine, on my step, swimming in the yellow and blue transparency, I learn — slowly — that the given comes upon you like a state of grace. … Aboard its ship buzzing with communication, the collective is not so much ill as intoxicated: drunk on language, drugged with noise, deprived of beauty, anesthetized. Morning and night, each one of them treads the same paths in the same relationships with the same people in the same channels with the same words. They cannot not do it, rather as though they had to rebuild a crumbling section of wall over and over again, to restitch a tapestry which unravels every night. Distracted. Insensate. I live no differently from these drugged individuals. I am devoted to language, which anesthetizes all five senses. Every group I am part of needs it or lives by it. This is the healing I seek from the god Aesculapius on a winter morning: not just the silence of my organs, in harmony with the silence around me, but even more than that, the silencing of language within me. My very first, and hardest detoxification treatment. … Sitting down alone, in silence, on a marble step in Epidaurus under the winter sun, far from the throng, focused for a few hours: this is a necessary, but not a sufficient condition. Doubtless much more is required to achieve the sufficient condition, in order that the world give itself to the healed body; in order that what is given, gracious as it is, should come and sit next to me; in order that I might actually observe something.